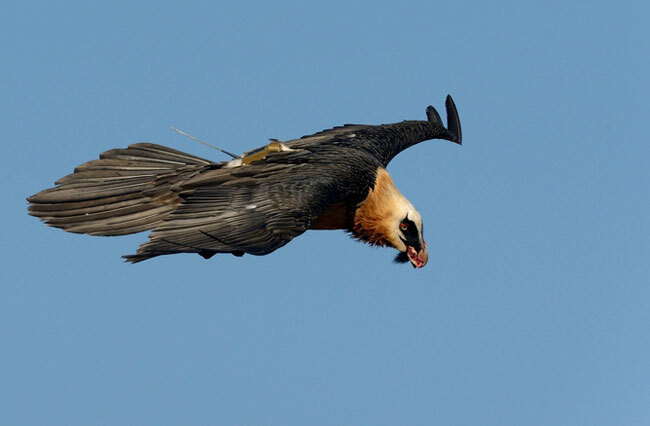 The young bearded vulture, fledged in late July, is an extraordinary milestone in the bearded vulture reintroduction project in Andalucía, and a just reward to the many people that worked so hard to bring back this species to southern Spain, and particularly to the Junta de Andalucía, that since day 1 has invested politically and financially in this project. Esperanza is the offspring of Tono, a male released in the first year of the reintroduction project in 2006, and Blimunda a female released in 2010. Esperanza has been tagged with a GPS tag, and as a result researchers have been following its movements (see here). The bearded vulture was widespread in the mountains of southern Spain until the 40s, but intense human persecution and widespread poisoning cause it to disappear from southern Iberia. The last confirmed breeding took place in Cazorla in 1983, and in 1986 the last adult also disappeared. In the end of the 80s a number of conservationists, led by the regional government, started to establish the first contacts (with the then precursor of the VCF), to try to start a reintroduction project – the photos below are from the first ever visit to Austria, where the first ideas and strategy were developed. Releases in Andalusia started in 2006, after the Junta, and Fundacion Gypaetus, established locally to manage the project, initiated an ambitious conservation programme, mainly focussed on minimizing the endemic tradition of poisoning the sierras to control predators. So far a total of 39 birds have been released there, including 6 this year. At least 22 of these are still alive.